Okay, in light of the fun from the 100th Reunion podcast and in-game party, let’s kick off this week’s HoloNet Links with a fun little video. There is nothing better to keep things in perspective than by watching a funny video. Youtube user, Exendar has created a perfect video for bringing a smile to your face, called SWTOR – spacebar. We have another update concerning the dates on upcoming patches and events. 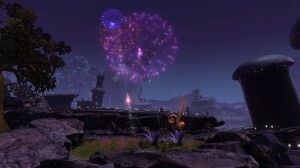 Bruce Maclean posted the latest Summer of SWTOR Update in the official forums. Along with the dates, he also gave us more details for each event and upcoming update. Starting with the Gree Event coming back for a two week time period, beginning on July 23rd. This time the Gree Event will be scaled for level 55. According to Bruce, players can also expect to see better loot drops, commendations and achievements. The post also mentions one possible drop is a new vehicle mount, called the Sphere Transport Enclosure. Next on the list, Update 2.3 is scheduled to go live on August 6th. This will begin the Titans of Industry storyline, revolving around everyone’s favorite company, the Czerka Corporation. The update will include two new Flashpoints that have direct ties to the Czerka Corporation. These Flashpoints have a Story mode and a level 55 Hard mode. This update will also introduce a new Story mode element to the Group Finder, a role-neutral for the Czerka Flashpoints. The post mentions, the role-neutral feature to Group Finder for these two Flashpoints, will take the first four players and form a group, no matter their roles. This will help make getting a group go much faster, but also may mean your group doesn’t have a healer or maybe no tank. It will be interesting to see how this feature works when it goes live. Update 2.3 also will include a new Czerka based Daily area to earn commendations, reputation with Czerka. The reputation points will unlock the ability to purchase certain adaptive gear, weapons and new droid companion gear and being that it’s Czerka, there is probably a few schematics laying around to purchase. As we discussed in a previous article, Treek will make her appearance in Update 2.3 as a new possible companion, players can get through Legacy level and credits or via the Cartel Market. 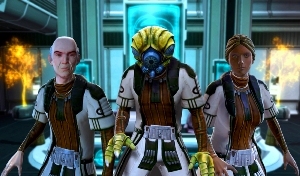 August will also bring a new recurring event in SWTOR, Bounty Contract Week. It is scheduled to launch August 13th. This will be a series of full voice-over missions to bring down contracts. This event will also be available for players that are level 15 through 55. So, basically if your character has their ship to fly across the galaxy you can participate in this event! The event will also have some nice rewards from another new mount, adaptive gear, weapons to even a new companion customization for HK-51…please let there be an HK-47 rusty orange customization! The post also states it will return the next month. Now we get to Update 2.4, which we now have a target date for it being October 1st. The update, from reading the post, is going to be pretty big for the amount of things being offered. Bruce has confirmed there will be 4 vs. 4 Warzone arenas coming in this update and that is a good thing! Now, if it was me I would have stopped there, but Bruce went on to say the update would include two new Operations, along with a short story arc for the new planet Oricon, according to the post. While I agree with adding new content, I don’t think it was probably best to reveal all those PVE details and only one PVP morsel, considering BioWare dubbed 2.4 as the PVP update. I will agree with a post, we will look at in dev notes, by Eric Musco, that we still don’t know all the details on the Warzone arenas or the other “juicy details” mentioned in Bruce’s post. The best thing to do is look at the facts as we know them. BioWare is giving us some dates for releases of scheduled updates/events. BioWare is giving us more details on said updates/events. BioWare has stated there will be more information to come. Now, on all of those points BioWare has listened to the community and given us what we asked for…dates, details, and more information when it is available. It is not everything some of us want to hear and it is not every detail we want to know, but it is going in the right direction, as far as BioWare being more transparent with the community. It is fine to give your feedback to BioWare on your thoughts regarding this post, but it is best, if those remarks are put in a constructive manner. If you have an idea or a suggestion to this post, then you should reply and let BioWare hear it. However, if you are posting just out of rage, without offering any solutions, is that being helpful? Be sure to read through the entire post by Bruce Maclean and then if you need to leave your constructive comments and/or solutions, I urge you to head other the forum thread, started by this post by Bruce Maclean. Czerka is looking for new hires! Yes, that is right the Czerka Corporation has five current positions available for immediate employment. Listed below are the five positions the Czerka Corporation is currently seeking applications for. You can read through the job titles briefly describing each position below in the article or you can go read it on the SWTOR news blog. After reading through the job descriptions, why not submit your application to Czerka human resource department. There is an actual job application submission thread, which you can find through the link at the bottom of the new blog or go directly to the official forum thread. There have been some really creative ones already submitted. Which position would best fit your personality? Which position would you choose to submit an application to the Czerka Corporations? Droid Technician: Under supervision of Lead Technician, qualified applicants will guide the assembly and programming of state-of-the-art droids. Requires a strong understanding of motivators, complex circuitry, and combat algorithms. Biochemical Engineer: Will work with existing proprietary biosamples to create more resilient and powerful variants and combinations. Comprehensive knowledge of cutting-edge biotechnology a necessity. Bioethics certification optional. Organism Handler: Must be able to feed and care for a wide variety of exotic life forms. Strength, endurance, and the ability to mask anxieties under pressure are all major pluses. Security Officer: Completion of Class Seven psychological profile required. Applicants with abundant conflict experience will receive priority consideration. Research Contributor: Be a key player in Czerka’s development of new products by simply providing attendance and feedback. A wide variety of species and genetic traits needed. No experience required! We’ve been pretty quiet about this since Game Update 2.2.2 went live, and the reason is because I was tracking down exactly what we did and why the change for Ashara got missed! Thanks very much for the original feedback and for pointing out the error in the patch notes! It’s great to hear that the uneven skin/fur textures and colorings are fixed. Thanks to all those who submitted /bug reports, along with the developers for getting it patched up. It was concerning me that some of my crew members might have some skin issues conditions…what a relief. Glad to find out was just a graphic bug and it is fixed. We’ve been seeing reports of this nature and are investigating them. To assist, can you please double check your UI preferences on the affected characters and compare them to those that do not have the issue? There may be a bug with one of the toggles, for instance. Additionally, it appears that this only happens after an area transition (such as into a Warzone or Flashpoint), but we’d like to hear any additional details you can provide. For instance, does the arrow come back after you leave the instance? Any other details would be appreciated. Thank you. Sounds like BioWare is asking for anyone that has run into this issue with the target indicators to relay them the specifics, of when it happened, where, graphic settings, actions leading up to and after seeing bug etc. The more they know about the specifics surrounding the bug itself, the easier it will be to find the problem and fix it. I am getting that some of you are frustrated that there are also Operations coming in 2.4 as a PvP player. This is in no way taking away from the content you are getting. It just means that on top of being an update with PvP content, it also has PvE content in it as well. It is just a bigger update for everyone! To specifically address some of the concerns I am seeing in the thread. First, the 4v4 Warzone Arenas are not scaled down versions of the current 8v8 maps. 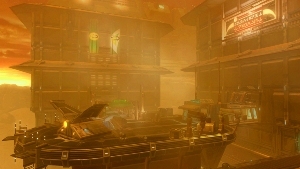 They are a brand new Warzone type (deathmatch) on their own brand new maps! Note: Plural! You will see more than one map at launch. As some have said, this is not the only thing coming in 2.4. We have stated before in this thread the purpose of this is to give you an overview, it does not have every detail. Some of your other concerns…such as queuing for Ranked, will be addressed along with 2.4. We are still working on details and 2.4 is still a ways off. We will continue to release information as we lock things in. I want to add on a personal note that one of the things I have enjoyed most over the past month or two at work is our twice a week Warzone Arena playtests. I am someone who primarily PvPs when I play SWTOR and they are so, so much fun. I cannot wait for you guys to get your hands on them! Okay, this is the post I mentioned in the section about Summer of SWTOR Update. Eric, stepped up as Community manager and listened to the opinions voiced in the thread. He and BioWare have heard you. In fact, Eric gave us more news for PVP’ers. They are giving us a new type of Warzone (deathmatch) on completely new maps, and yes, it is plural for a reason, as Eric also points out. BioWare is walking a tightrope about releasing content. Yes, the PVP section had been somewhat left out in the cold (Ilum pun). However, it is better they get the content right before releasing. As much as I support the PVP part of our community getting some love, there is no way BioWare can stop developing for the other parts of the game either. Update 2.4 is coming in October, we are just past the halfway point in July, that is almost two and half months away Let’s just take a deep breath, focus on what details BioWare has given us and let the other blanks get filled as the release of Update 2.4 gets closer. This past Saturday, Corellian Run Radio recorded its 100th podcast episode! If you haven’t had a chance to listen to this reunion of past and present podcast hosts, be sure to give it a listen. As a fan myself, it was great hearing some of the past podcasters, like Kathy, Roxanne and Deirdre. They were with the show when I first started listening and submitted my application to help out with the website. Give it a listen and let us know what you think! After the recording was done, the party carried over in-game on the Shadowlands server! Thank you to everyone who came out to have a good time partying, dancing, dueling, playing trivia and complimenting the hosts for the accomplishment. Thanks again to all our fans for being with us for the past 100 podcast episodes, and here’s to another 100 more! 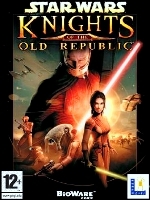 July 15th marked the ten year anniversary of the Knights of the Old Republic game being released. It was an important game in my personal gaming journey. I have always loved RPG games, but the game showcased how well BioWare treats story content. It also was a game where your decisions did matter. Now, it was not the first to do this, but it displayed how different a game’s outcome can be depending on the choices you made in dialog with companions and other quest related NPCs. It also gave you a cast of companions that joined you on your galactic journey, very much in spirit with the group of companions found to be at the core of the Star Wars films. 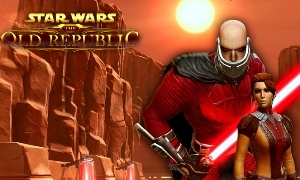 There is so much that you can say about KOTOR, but most important the game and BioWare brought to light an era in Star Wars lore that was previously untouched and that also led to us being able to play SWTOR. Thank you BioWare! If you want to read more about the 10th Anniversary and what impact KOTOR had on SWTOR from James Ohlen perspective, go read James’ Developer Blog concerning KOTOR. Do you have any questions for the developers and/or community team members? I am going to be at the Community Cantina, August 9th, in Chicago and would love to ask your questions to those in attendance. So, if you have any questions that you would like me to ask, please leave your question ideas in the comment section below or email them to me at jason@corellianrun.com Thanks!